Dhaka, 13 May, Abnews: Prime Minister Sheikh Hasina today asked the members of Bangladesh Army to keep a "constant vigil" to face any internal and external threats for safeguarding the country's constitution and sovereignty. "You'll have to always remain ready to face any internal or external threats unitedly for protecting the sacred constitution and sovereignty of the motherland," she said while opening 27 projects at different cantonments. Sheikh Hasina inaugurated the schemes through a videoconference from Dhaka Cantonment this morning. The projects included a cancer centre at Dhaka Cantonment, fertility centre, edible oil mill, various establishments of training and housing facilities for the army members. Chief of Army Staff General Abu Belal Muhammad Shafiul Huq delivered the welcome address at the function. PM's Security Adviser Major General (retired) Tariq Ahmed Siddiq was present at the dais. Describing Bangladesh Army as an "asset" of the country and a "symbol" of the confidence and the trust of the people, the premier also asked its members to be more "professionally-efficient" and "welfare-minded" with social and religious values. "Bangladesh Army is our asset and a symbol of confidence and trust of the people...so, you will have to be more professionally-efficient and welfare-minded consisting of social and religious values," she said. The prime minister hoped that the army members will also work with utmost sincerity in accomplishing their duty by keeping confidence in the senior leadership and maintaining mutual trust, sympathy, sense of brotherhood and responsibility, dutifulness and discipline. The premier said her government always wants to run the country as the servants of the people, never rulers. "We've got your constant cooperation to serve the people," she said, expressing her firm belief that the army will stand beside the people whenever it will be necessary during the running of the state by the present government. "Because, we have to keep in mind that the country and people are ours and our aim is overall development of all," she added. The premier said she has a strong family bond with Bangladesh Army as her two brothers -- Shaheed Sheikh Kamal and Shaheed Sheikh Jamal -- were members of the army. "My youngest brother Sheikh Russel also wanted to join the army," she mentioned with an emotion charged voice. "As I'm a member of the family, I think it's my responsibility to build an army suitable to independent and sovereign Bangladesh," she said. Sheikh Hasina recalled that Father of the Nation Bangabandhu Sheikh Mujibur Rahman framed the defence policy in 1974 by realizing the necessity of a developed and professional army. At his directives, she said, Bangladesh Military Academy was established in Comilla in 1974 as well as other establishments including the Combined Arms School and training centre for every corp. The premier said in the light of Bangabandhu's far-reaching defence policy, a process for modernisation of the army is underway side by side with rearranging and changing its organisational structure. As a result, she said, the army has reached a dignified position at home and abroad. "You'll have to uphold your reputation of which guidelines were given by Bangabandhu," she said. Pointing out that the present government believes in development, expansion and modernisation of the army, the prime minister said the government has taken all necessary effective measures keeping this goal ahead. "The National Defence Policy was approved by the cabinet," she said. Mentioning that the government is pledge-bound to build a modern and all round armed forces, Sheikh Hasina said for this the government has framed the Forces Goal 2030 which is being implemented in phases. As part of it, new infantry divisions, brigades, units and training centres were established, while some infantry battalions are being turned inti para battalions and mechanized battalions, she said. The prime minister said her government has established para commando brigade for the first time, while MLRS and Missile Regiment have also been added to the army for further strengthening the country's defence system. Besides, the present government has strengthened capability of the army to a great extent through inducting various modern war equipment, helicopters and modern infantry gazettes to keep pace with the developed world, she said. Referring to her government's decision in 2013 to get females admitted in the army, Sheikh Hasina said, in continuation of the initiative, appointing female pilots for the first time in the history of the army will initiate a new horizon. 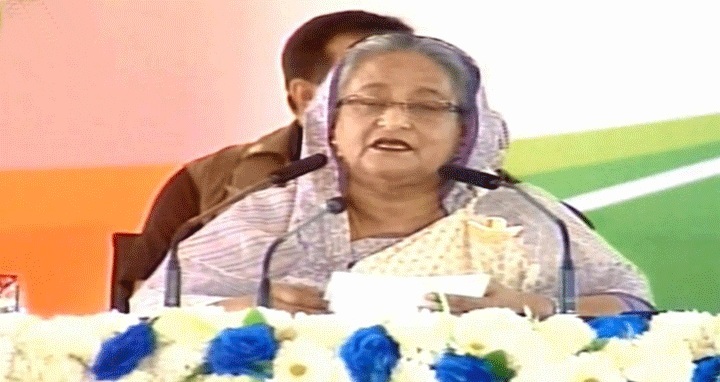 Sheikh Hasina said she today inaugurated 27 projects of the army including cancer centre, fertility centre, edible oil mill and other infrastructures. "These will play a very important role in increasing operational capability of the army, training facility, as well as for the development of living standard of their families," she said. Sheikh Hasina said she feels proud for the role of the army during country's crucial moments like natural disasters and anti-terrorism drives. Besides the main activities, she said, the army has engaged themselves in the nation-building programmes. "Due to your professional efficiency, the important responsibility for supervision work of the Padma Bridge and the construction work of Cox's Bazar-Teknaf Marine Drive, the Hatirjheel Project, Bahaddarhat Flyover, Mohipal Flyover and Thanchi-Ali Kadam Road was given to you," she said. Sheikh Hasina said the army members at different foreign missions are bringing honour and dignity through sacrifice, dutifulness and professionalism which has further brightened Bangladesh's image abroad. The prime minister highly praised the role of the army in relief distribution among the Rohingya people, construction of shelter centres and providing medicare facilities for them and said their immense contribution further brightened the image of the country. Highlighting her government's tremendous successes in different sectors, the premier said Bangladesh has graduated to a developing country from the least developed group. "The country got the recognition leaving 16 countries behind," she said, adding all will have to work to keep up this achievement. from a food deficit country. "We formed the government in 1996 with 40 lakh metric tons of food deficit and from that position, we turned it into a food autarky country within two years," she said. She said though natural calamities take place sometimes, her government is fully aware of ensuring food security for all time. The prime minister vowed that Bangladesh will move ahead keeping its head high not begging from others. "We don't want to be the leader of beggars, we want to be self-reliant in all sectors," she said. On the Rohingya issue, the premier said her government is hopeful of solving the protracted problem. Mentioning that her government gave shelter to 11 lakh Rohingyas on the humanitarian grounds, she said discussion is underway with Myanmar for repatriation of its forcibly displaced people and an agreement was signed between the two countries. "Myanmar has agreed to take back its citizens, but they yet to take any effective measures in this regard," she said, adding as a result the international pressure on Myanmar is increasing and all countries are extending support to Bangladesh. Sheikh Hasina said Bangladesh has set a new milestone launching its first communication satellite Bangabandhu-1 into orbit on Saturday. "The satellite was successfully launched and it is a big achievement for Bangladesh," she said. Sheikh Hasina said it was new process and technology and the rocket returned to the earth safely after successfully launching the satellite. "We won the maritime boundary against India and Myanmar and solved enclave problem ... our position in water, land and space has become clear and specific," she said.